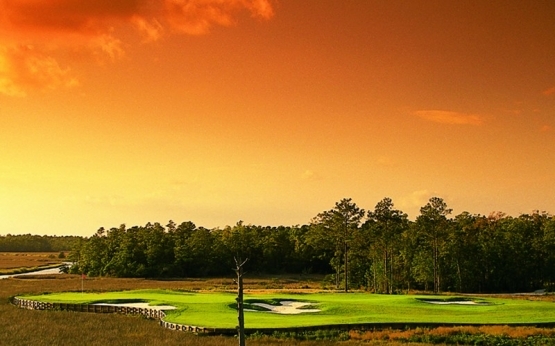 Golf Digest named Carolina National Golf Club one of the finest playing experiences on the eastern seaboard for good reason. This Fred Couples signature course has a beautiful setting along the Lockwood Folly River and incorporates the natural terrain beautifully. The 27-hole course winds its way through marshlands that serve as an Audubon-Certified Sanctuary Golf Course and provides a natural setting for a wonderful low country golf experience. The course features three nine holes the Egret, Heron and Ibis and they all offer unique challenges to all skill levels as it incorporates five sets of strategically placed tees to ensure each player can maximize their golfing experience. From the tips, the course measures just over 7,000 yards so even the expert players will have plenty of challenges. Carolina National is located just to the north of Shallotte, N.C. and only a short drive from North Myrtle Beach making it the perfect course to include in your Myrtle Beach golf package. North Myrtle Beach is the perfect place to stay while you are on your Myrtle Beach golf vacation as it is in the center of so many area attractions and offers so many choices in hotels, beach homes & condos and the world famous O.D. Section of North Myrtle Beach (home of the “Shag”). Also while visiting the Grand Strand, you can take advantage of many world renowned golf instructors to help improve your game with a golf lesson. Book your Myrtle Beach golf vacation today! Great courses ! Good deal. on the ibis course I would have liked to have had the distance from the tee box to the water hazard.